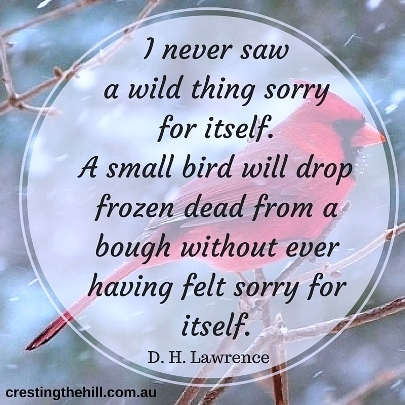 My husband has this D.H. Lawrence quote as the screen saver on his computer. It's a reminder to him that self pity is a human condition and one that we need to combat wherever possible. Nobody likes a light sucker and nobody wants to be around someone who is always feeling sorry for themselves. We live in a world of plenty and we have so many opportunities available to us. As we get older some of our options change and sometimes it can seem like there is less to be grateful for, but this boils down to perspective. Yes our health might take a bit of a hammering at times, we might feel a bit ragged around the edges, we might even have some serious concerns.....but sitting around bemoaning the fact doesn't help one little iota. So much of our happiness and contentment is determined by what goes on in our heads and how we perceive our world. We can choose to focus on the not-so-great stuff and sit around having our own little pity party, or we can choose to look at the good stuff instead. We can be grateful to be alive and well and living in a beautiful country that has so much to offer us. We have friends and family who love us, jobs to keep us busy, projects that we can involve ourselves in to give us purpose, and a future that holds whatever we choose to aim towards. I don't intend to be the light sucker that nobody wants to talk to because I'm always whinging about something. I don't want to sit back and accept stuff that makes me miserable. I intend to be proactive - to make changes (even when it's scary!) and to create a world that I can be content in and that has possibilities that I can look forward to. I don't want to be the old person who sits at home waiting for the family to visit, complaining about my aches and pains and generally being sad and sorry for myself. No, I intend to be the old lady still having a blast in my 80's and beyond! 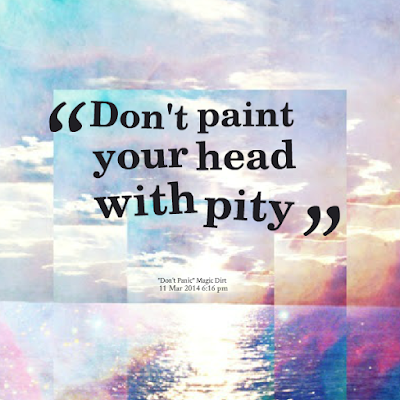 This post was part of the #1word challenge - this week's word was "pity"
Hi! Good reminders! I am also in that empty-nest stage, and I don't really "love" this stage and am still adjusting. But, attitude does really make so much difference, whatever our situation, I need to remind myself often to focus on the blessings and not the perceived negatives. Nice post! I've never had much patience with self pity ... mine or that of others, to be honest! me either Carol - I used to think it was my impatience - now I think people need to choose their attitude! I love that quote on your husband's computer and it really says it all. Life is too full to be depressing if you don't like a situation change it. There are times when we all get down, but spreading it around won't help at all. I love you perspective as always Leanne! A pity party is pretty pitiful. Not a good idea to indulge. That said, I loved learning a new phrase for it [a new phrase for me]: Light sucker. thanks for the intro. You are most welcome Lisa - I hope they see how miserable those type of people are and steer away from it! I discovered that my brain is good at going for pity a couple of months ago and it had a really good reason: if people felt sorry for me then they'd take care of me! Learning to have compassion for that part of myself helped me notice more quickly when I am headed for a pity party and has me asking myself how I want to so show up, instead! Great post! You don't seem like a pity partier at all Sue and that's why you stay so young and vibrant - it's a lesson for us all! Amen! This is my first visit to your blog and I loved it! I'm so glad I found you at #JoyHopeLive! Great post as always. I cannot stand to be around light suckers. I have no patience for them at all. I'm too busy being positive to listen to others pity me stance. This hits it right on the head. I'm not going to be that old lady either! Let's have a blast together! sounds good to me Brenda!! 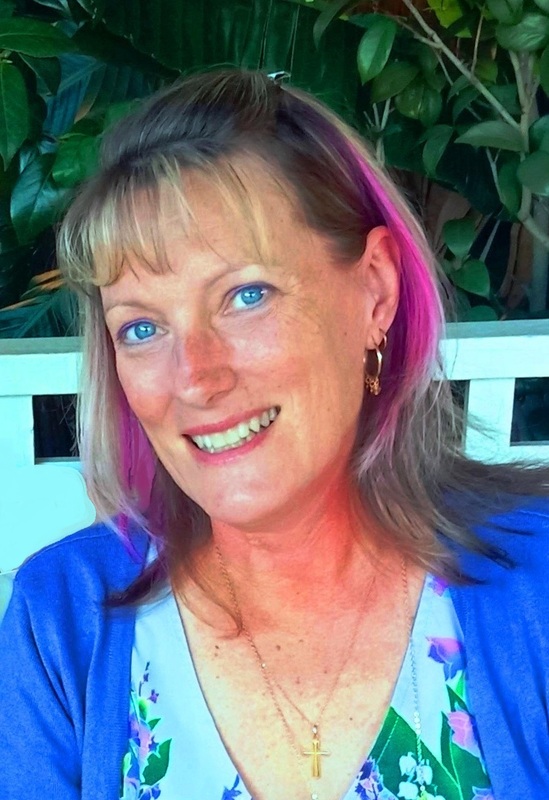 Thanks for joining us at #WednesdaysWisdom Leanne always great to read your posts. I love your ideas for content. See you at the next link up. That is a great quote...can understand why your husband has it as his screen saver. Thank you for sharing with us at #JoyHopeLive!